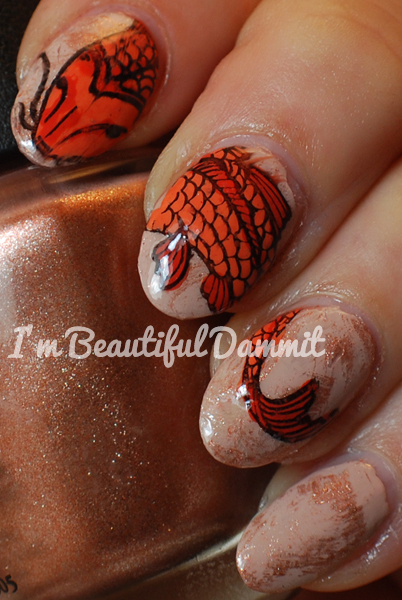 It is Day 2 of the 31 Day Nail Art Challenge, and today's prompt is the color orange. My manicure was inspired by the one seen here by Lacquered Lawyer, using the reverse stamping method. This is my first time actually trying it out, and I found it to be a pretty simple process. Even if it did take a little longer than normal to do because of having to wait for the polish to dry in each step, I think the wait was well worth it for the result I got. Really could not have been easier to do! OPI - Tiramisu for Two for the base color. OPI- Worth a Pretty Penne for the shimmery drybrush effect. OPI - Call Me Gwenever on the fins. OPI - Where Did Suzi's Mango mixed with Call Me Gwenever for the body. Sally Hansen - Black to Black for the stamping polish.